There are examples of successful policies in Zimbabwe, informed by evidence. But, since independence, policy making has largely been reactionary and ideologically driven. This has resulted in many policy inconsistencies and failures. The need to build institutional capacity to make informed policy decisions in Zimbabwe is especially urgent now as Zimbabwe faces major economic challenges. 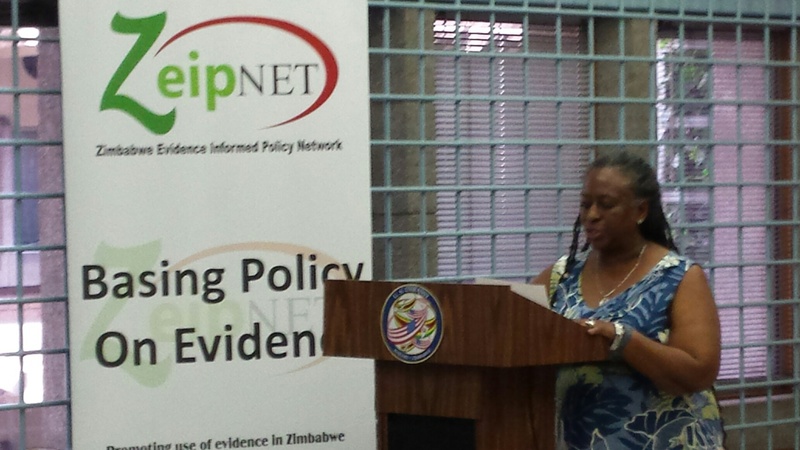 Last month, the Zimbabwe Evidence Informed Policy Network (ZeipNET), in partnership with the America Embassy Public Affairs Section in Harare, held a knowledge café on evidence-informed policy making in Zimbabwe. Speakers included: Onesimo Maguwu, USAID public health expert from; Charles Dhewa, knowledge management speacialist from a Zimbabwean agro-based think-tank Knowledge Transfer Africa; and Grey Chivanda, former policy-maker from the ministry of higher and tertiary education. In the 1980s there were pockets of good, well-intended policies that were based on evidence. For example, much of the success in manpower development in Zimbabwe is attributed to the Manpower Planning and Development Act (1984). This policy was a result of findings and recommendations from the Manpower Development Survey of 1982. There are also some examples of successful evidence-informed policy in the health sector (such as those relating to male circumcision and maternal health). At that time, Grey Chivanda said, most of the evidence used to inform policy decisions was obtained through partnerships with multinational organizations like UNESCO, the Africa Union, the World Bank and the IMF. But the complexity of policy making is still not fully understood. From the government’s perspective, policy making is linear. This makes it very difficult to use evidence effectively to inform policy decisions throughout the policy-making cycle. Civil-society organizations have the power to influence policy but do not always use evidence to inform their interventions. Another challenge observed was that people are not used to questioning government’s policy decisions. What’s more, members of the public, particularly the youth, feel that policy making is for technocrats, not for them. Researchers should package evidence for policymakers at different levels. As one delegate pointed out, “being a good researcher does not make one a good communicator.” This is particularly critical at local government and in Parliament, where some members do not possess sufficient literacy skills to comprehend issues in English or scientific language. Although there may be challenges to ensuring evidence-informed policy making (including political will and availability of resources) there are also many opportunities. The structures exist but they are isolated. The task now is to harmonize these and establish a working national evidence infrastructure to support evidence-informed policy making in Zimbabwe. This blog was first published in researchtoaction.org.